On December 28, in the midst of the joyful season of Christmas, we celebrate a… slightly less than joyous occasion. More particular, we celebrate the Feast of the Holy Innocents, which honors the children who were slain shortly after the birth of Christ. There isn’t a lot of history backing up this particular incident, to be completely honest. But then again, that’s mostly because Herod was so insane that killing an entire town’s population of infant boys was not really considered to be too remarkable. What can I say? He killed a lot of people in his day, and it was hard for the record keepers of the time to keep up with the death count! These children are considered the first martyrs of the church. After all, they were slain because of Christ and Christ’s claim to being the messiah. When we celebrate this day, we remember their too-short lives and remember that Christ takes care of all of His flock — including these Holy Innocents. Also, many families that have lost a child remember and honor their own children that they have lost on this day, remembering that, just as God does not forget these Holy Innocents, God will never abandon their children. There is surprisingly a lot of art about this subject! So, for today, I would like to focus on three pieces of art which delve into this scene: a painting, a novella, and a song. 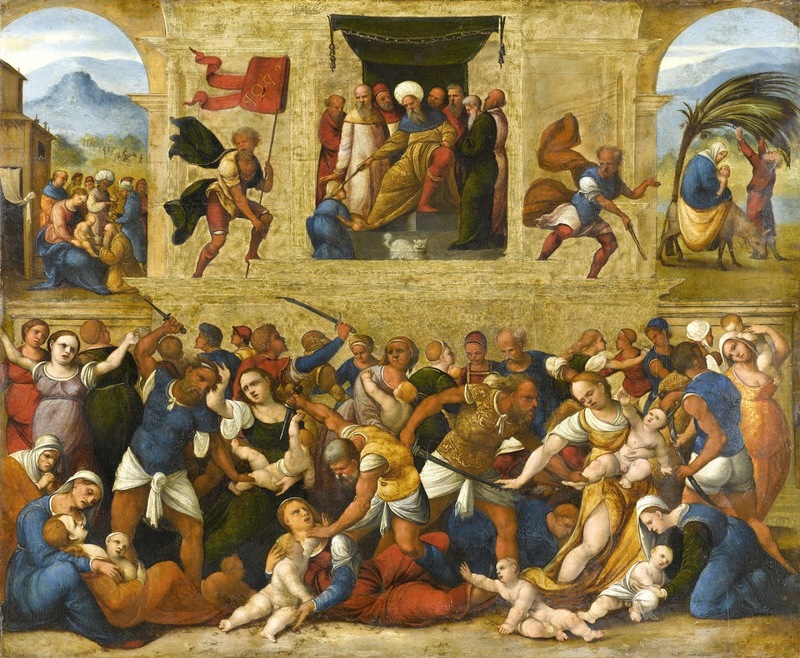 Massacre of the Innocents, by Ludovico Mazzolinio, c. 1510-30. Rijksmuseum, Amsterdam, Netherlands. There are three different scenes in this painting! In the background to the left, you can see Jesus being visited by the Magi, who are bringing Him gifts, with Mother Mary graciously receiving them. Then, in the background to the right, you can see the Holy Family fleeing to Egypt. And, in the forefront? Mothers with their infant sons are doing their best to keep their sons from being slain by Herod’s soldiers. Up top, Herod seems to be supervising the scene, directing the Roman soldiers (one of which is brandishing the SPQR flag, or “Senatus Populusque Romanus” flag) to kill the children. …it’s quite a heartbreaking scene, to be honest. I have a son who is now 19-months-old, and just imaging this sort of chaos makes me shudder. Death of adults of one thing, but for innocent children to be slaughtered? That’s evil. Pure and simple. I hate to admit it, but I didn’t read it until after she died. Still, it’s a lovely (short!) novella which features the (fictional) fourth wise man and his quest to give treasure to the Christ child. Except, he doesn’t meet up with the other three wise men. So, he doesn’t know where Christ is! The rest of the story, he spends searching for Christ… and encounters several adventures on the way! …and! Not to give too much away, since you should totally read it, but guess what scene he stumbles on? If you guessed “massacre of the innocents” you would be correct! Anyway, it is a really good story that you should read! And it’s totally relevant for the day. Apparently, there’s a song about the Massacre of the Innocents! In fact, you’ve probably heard it, though you might not have known what exactly what it was about, since the original song is in an older dialect of English that we’re not used to hearing. The song was part of a Christmas play that was first performed probably in the 16th century. At this point of the play, Joseph has just had his dream from the angel, urging him to get up his family and leave for their flight of Egypt. Then three women from Bethlehem enter onto the stage with their children and sing this lullaby to Christ so that He may sleep through the flight to Egypt without being discovered — with the full knowledge that their children by their side will be slaughtered. For many, especially those who have been going through a loss of a child, Christmas can be a really tough ordeal to go through. After all, Christmas is the time that many families come together to celebrate, yet loss can make a family feel as if they have been broken apart. Yet, this day is reminder that, even in those moments of joy, there can also be profound sadness and grief. And that’s okay — we can celebrate both, in their own way. Yet, no matter where we are in our lives or what we’re encountering, God is there with us. Please keep the innocent ones who are victims of violence under Your protection. The text, music and images work beautifully together, Well done.